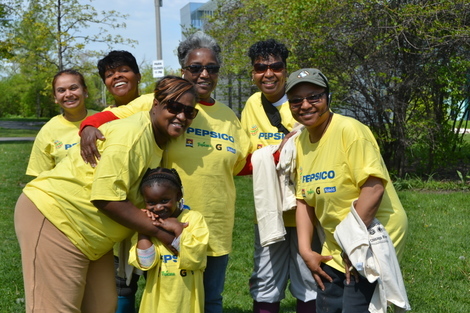 Lead Sponsor PepsiCo and employees working together at Clark Park. To view the 2018 sponsorship information describing sponsorship levels and benefits, click here. In 1992, Friends of the Chicago River hosted 25 volunteers for “Chicago River Rescue Day.” That small group “rescued” the river by pulling old shopping carts, mattresses, and plastic bags from its banks. Little did they know that day would continue year after year, evolving into Chicago River Day, which now hosts thousands of volunteers at over 60 sites along the river each year. We cordially invite you to join Friends and thousands of other volunteers on the banks and beyond for our annual Chicago River Day event. Volunteers will gather for a day of hands-on environmental work along the Chicago River. Volunteers range in age from pre-schoolers to seniors, represent a wide variety of ethnic and economic backgrounds, and reside throughout the 673-square mile Chicago River system. They work side-by-side to collect garbage and sort for recycling, remove invasive vegetation, spruce up river-edge trails, plant native seedlings, and much more. Your sponsorship of this major event creates huge ripple effects that allow Friends to continue our work throughout the year on behalf of the Chicago River. To view the 2018 sponsorship information describing sponsorship levels and benefits, click here. If you are interested in learning more, please email Joanne So Young Dill or call 312-939-0490, ext 23.